In ICTO’s newsletter issue 2, we introduced Microsoft Office 365 ProPlus and briefly mentioned its registration and installation methods. After that, due to high demand and lot of inquiries on the topic, we would like to share more about the installation steps of Microsoft Office 365 ProPlus here. 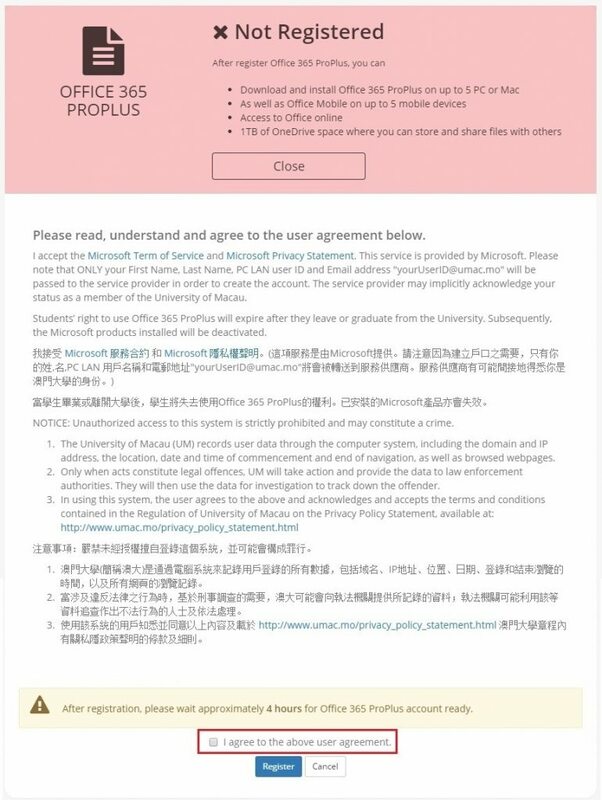 All UM staff and students can use their computer account to register Office 365 ProPlus account. Each user is entitled to install Office 365 ProPlus on up to 5 computers (devices including PC or Mac) as well as to install Office Mobile on up to 5 mobile devices without additional cost. Login to ICTO Account Information Page, https://account.icto.umac.mo/. If you are student, Office 365 ProPlus is activated along with UM@Connect application. For student who does not have UM@Connect account and want to apply for Office 365 ProPlus only, please send a request to icto.helpdesk@umac.mo for further arrangements. Go to “Office 365 ProPlus” part and click “More” for applying license. After reading the user agreement, click the box high-lighted and click “Register”. After registration, you need to wait approximately 4 hours for Office 365 ProPlus account to be ready. Install Microsoft Office 365 ProPlus for Free! Once your account registration is completed, you can login Office 365 to download and install Office 365 ProPlus. Sign in to Office 365 at https://login.microsoftonline.com/ and login with your PC LAN user ID and password. After login, click “Install Office 2016” button on the Office 365 home page. For a PC install: Depending on your browser, click Run, Setup, or Save to begin the installation. For a Mac install: Open Finder, go to Downloads, and double -click Microsoft_Office_2016_Installer.pkg (the name might vary slightly). 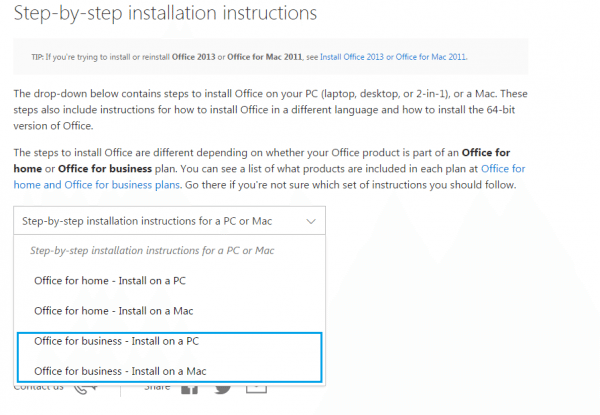 Remark: Please choose either “Office for business – Install on a PC” or “Office for business – Install on a Mac” to download the installation instructions.